Scott Coupland in action for Deeping Rangers. Deeping Rangers couldn’t have had a more daunting first round tie in the Hinchingbrooke Cup tonight (January 19). Unbeaten United Counties Premier Division side AFC Kempston are lying in wait at Hillgrounds Leisure. They beat Deeping 2-1 in a Premier Division match at the same venue last month. 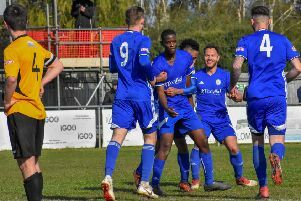 Deeping are enjoiying a decent season themselves. They are fourth in the Premier Division table, just six points behind Kempston, although they have played four more matches. Deeping will have a chance if free-scoring forwards Scott Coupland and Scott Mooney find their form. They have scored 42 goals between them this season with Coupland the joint top scorer in the league with 24. A much easier game at home to rock-bottom Premier Division side Huntingdon Town awaits the winners of tonight’s tie. Blackstones are in Lincs Senior Trophy semi-final action tomorrow (January 20) when hosting Boston Town at Lincoln Road. United Counties Division One side Blackstones will start as underdogs against Premier Division opposition. Boston have already knocked top Premier Division sides Holbeach and Deeping out of the competition. The second semi-final between Winterton Rangers and Barton Old Boys takes place next month (February 9).